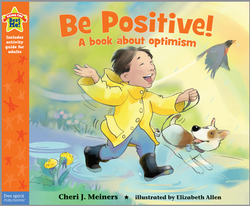 Guest Post: A New Review of BE POSITIVE! Be Positive! is one of a new four-book series from Free Spirit Publishing called “Being the Best Me”. The other books in the series are: Feel Confident!, Have Courage! , and Bounce Back! Be Positive! takes a comprehensive look at ways to have a good attitude about not only things you like, but even things that you might not like so much. Be Positive! starts out with waking up, and expecting to have a ‘great new day’, then shows how our attitudes are a choice we make about everyday things that can make a difference not only for ourselves, but for those around us. It then shows children engaged in activities by themselves and with others, learning new things, and trying their best at hard things. One of the sentences I liked was, “I can do important things with my head and hands, and with my heart.” This is a very wonderful aspect of having a positive attitude. It is not just doing something you always do, it is about thinking about what you are doing and caring about it as well. This book also moves a child from self-centered activity to understanding how actions involve others. “Doing something nice for someone can help me feel happy faster than anything else.” Another difficult concept for children happens when bad things happen, or when things don’t go their way. I am glad the author didn’t go overboard on this, as so many very bad things do sometimes happen. Instead, she uses normal things nearly every child can relate to, like bad weather or going to the dentist. This leaves the very difficult questions for another book, more targeted to the issue. After the story, there is a teacher/parent guide to the book with tips on how to discuss and reinforce the issues presented. There is a list of keywords and additional questions separated nicely by page grouping for a more in depth discussion. The vocabulary of the story is suitable for young readers to sound out by themselves, but not the included instructions which are intended solely for the adult. The illustrations are expressive and simple so that it is easy to see how each character feels about what is happening.